I’m pleased to announce that KeeFox 1.4 has been released, including a new look that allows you to access all KeeFox features from a single toolbar button. 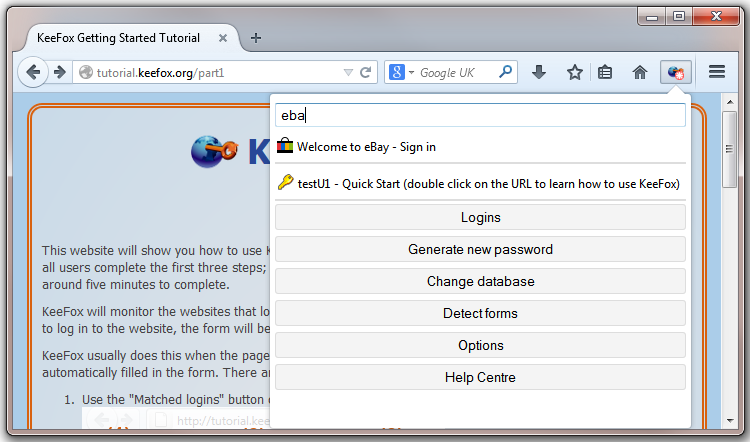 There are some new features too, such as the ability to search for KeePass logins without leaving Firefox. Most of these features are only possible in the brand new Firefox 29 but users of older versions of Firefox will still benefit from a few minor changes and bug fixes. Thanks to the KeeFox translation team, the new version will also be available in three new languages: Finnish, Russian and Spanish. Mozilla will now review the new version, so it should be delivered to your browser within a couple of months. If you’d like to install the new version before Mozilla have reviewed it, you can find the install button here. For those that wait until the approved version is released by Mozilla, you can continue using earlier KeeFox versions in Firefox 29 although it will only work properly if you use it in the default full-width toolbar mode. There is also currently a bug in Firefox 30 which can cause some minor problems in KeeFox 1.3 and earlier. In case the bug is not fixed by the time Firefox 30 is officially released in 6 weeks time, KeeFox 1.4 contains a workaround. As usual, a list of notable changes are in the release notes and you can see all the technical detail about the changes at github.